Professor Eric van Oort uses this 'virtual oil rig' to do research at the University of Texas at Austin. He helps advise companies on how to improve operations. 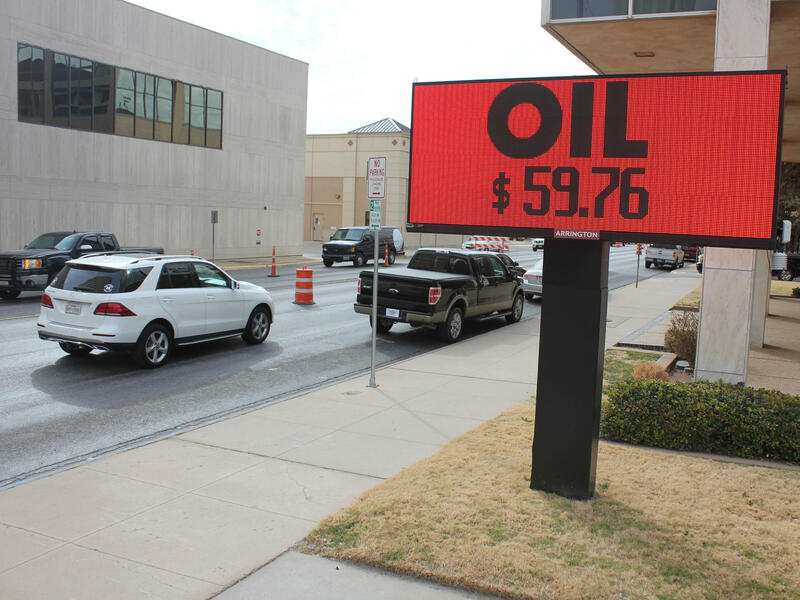 An LED light flashes the going price of a barrel of oil in downtown Midland, Texas. U.S. production is at record levels even though the price of oil is not nearly as high as during the last boom. At the Permian Basin Petroleum Museum, facilities manager James White demonstrates how a 'Johnny Popper' engine used to power oil pumpjacks. The U.S. is on track to become the world's biggest oil producer, pumping out more crude than at its peak nearly a half century ago. For decades, few expected such a comeback, and it's all the more remarkable because the price of a barrel of oil is nowhere near what it was during the last, recent boom. "This is an incredible statement, but we're probably making more money at fifty dollars a barrel than a hundred," says Kirk Edwards, president of Latigo Petroleum in Midland, the de facto oil capitol of West Texas. Downtown, not far from Edwards' office, a big LED sign flashes the going price of a barrel of oil. A few years ago, when the number was over 100, rigs were going up everywhere across the state's Permian Basin, as drillers made crazy money. Then came a crash, courtesy of the Organization of Petroleum Exporting Countries. "OPEC was trying their best just to slam the door on what was going on here by flooding the oil markets," says Edwards. "They did a phenomenal job." Companies went bankrupt and hundreds of thousands of people lost jobs. In Midland, some laid off workers abandoned cars at the airport as they flew back home. People started to wonder if the good times would ever come back. They have, even though the price of oil is nowhere near its old high. One reason for that is a lower cost of doing business. Oilfield contractors who survived the bust did so by slashing prices. Subcontractors, of which there are many, started charging less. Edwards says that significantly brought down the investment needed to drill a well. The head of ConocoPhillips has even boasted that his company can now break even when the price of oil is below $40 a barrel. Technological advances in the way oil and gas is sucked from the ground are also helping producers cut costs. The flat, khaki-colored plains outside Midland are crowded again with rigs and pump jacks. Tommy Taylor of Fasken Oil and Ranch shows me a fracking operation where water, sand and chemicals are injected into the earth to separate oil from rock. Inside an air conditioned control center, called a frack van, men can monitor information coming out of the well. "Look at all the computer screens," Taylor says. "We used to frack jobs on the tailgate of a pickup, and so we've come a long ways." Fracking has been around for years, but companies have managed to continually increase its speed and efficiency, a trend sometimes referred to as "fracking 2.0." Plus, Taylor says, companies are getting more oil than they used to thanks to expanded use of horizontal drilling. That means drilling down, through layers of oil rich shale formation, and then drilling across, sometimes for miles. "So there's oil and gas in the ground that we never thought we'd be able to access," says Taylor. "It's just phenomenal." Another big change is automation. 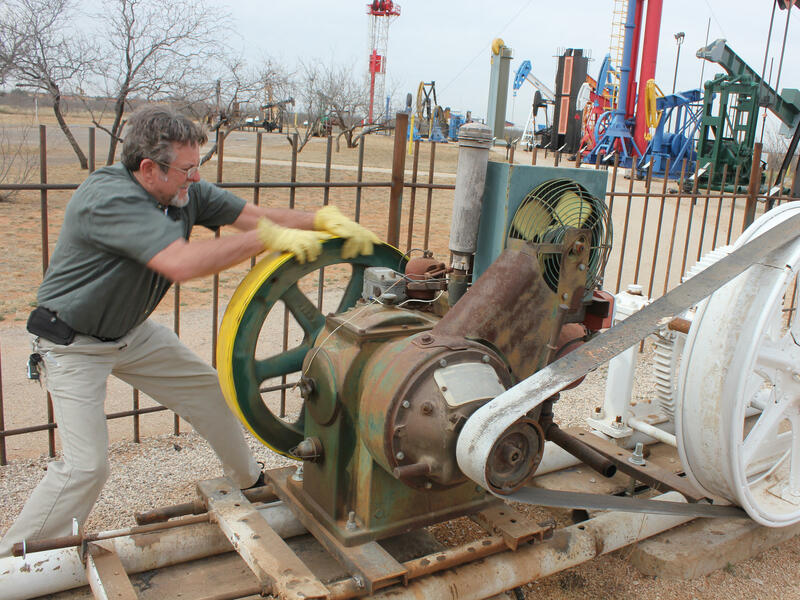 At the Permian Basin Petroleum Museum in Midland, facilities manager James White demonstrates an early engine for powering a pumpjack, called the "Johnny Popper." He grabs a huge wheel and spins it to get the machine working, as it emits a staccato string of pop sounds. But today, "guys don't have to get into pickups and drive out to their pump jacks everyday like they used to," he says. Modern technology does it. "That's cool," he adds. "It just puts people out of work." Those with the brawn and skill to do the dangerous work of drilling wells and putting pipe down them are called roughnecks. But more of them are being replaced with a robot, called an 'iron roughneck.' Companies are also turning to drones, smart drill bits, even autonomous rigs that can drill an oil well on their own. "If you see those in operation that is definitely an 'oh wow' moment," says Eric van Oort, of the University of Texas at Austin. 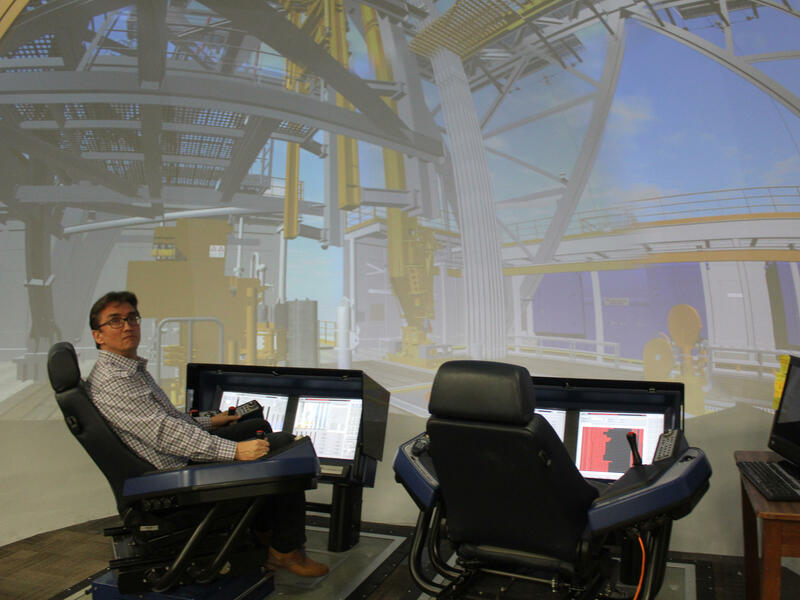 He says automation is making oil fields safer. And "we are creating much more sophisticated, higher end jobs in the process," he says. He runs a lab where graduate students can analyze oil wells remotely, then advise companies on how to improve their operations. But all this technological change has a cost. Even as the US produces more oil than ever before, the Labor Department finds 50,000 fewer people working in oil and gas extraction than at the height of the last boom. At a diner in Midland, R.T. Hale worries his machine shop is fast becoming obsolete. He's repaired oilfield equipment for 47 years. But "my machines were made in the U.S. They've all went out of business," he says. "Things I used to repair, they throw it away and stick a new one on it." Even those prospering in the current oil boom aren't taking it for granted. At Midland's Petroleum Club, Jim Henry, CEO of Henry Resources, pauses to chat before sitting down to a filet mignon lunch. "It's a high now," he laughs. "It's fun. Everybody's making money." But Henry says America's new position as global oil king won't stop the eventual busts. In fact, he thinks the massive amount of production might even accelerate the industry's highs and lows. Drilling so much can push down prices, causing operators to pull back, an endless cycle that seems to be speeding up. "It'll be hard to keep up with," he says. It's expected that the U.S. will be producing more oil than any other country by next year. That's thanks in big part to advances in technology. Mose Buchele of member station KUT looks at what those advances mean for the oil industry and its workers. MOSE BUCHELE, BYLINE: To understand what's changed, we're going to start with a trip to the past. JAMES WHITE: We have the Wichtex model 66. BUCHELE: I'm at the Permian Basin Petroleum Museum in Midland, Texas, with James White. He's showing me how workers used to get oil from the ground. WHITE: So I'm going to try to get this thing to start for you. BUCHELE: He's at a waist-high steel engine with two huge wheels attached. It's called a Johnny Popper. He grabs onto a wheel and spins it to get the machine working. This was used to move pump jacks. The Johnny Popper was outdated by the time White started work in the oil fields. He says since then, things have changed even more. WHITE: Guys don't have to get in pickups and drive out to their pump jacks every day like they used to have. It's done with a lot of modern technology. And, you know, that's cool. It just puts people out of work. BUCHELE: Next stop, a lab at UT Austin where Professor Eric van Oort shows me that modern technology. ERIC VAN OORT: So we're in the Real-Time Operating Center or remote collaboration room. BUCHELE: Students are sitting at computers where they can monitor information streaming in from oil wells hundreds of miles away. VAN OORT: More and more we see operators willing to share data with us. We analyze it, and we give advice back to them. BUCHELE: To help them get the most oil possible out of the ground. Another big change is automation. It's always taken brawn and skill to do the dangerous work of drilling wells and putting pipe down them. And those workers are called roughnecks. But more and more of them are being replaced by a robot called an iron roughneck. Companies are also turning to drones, smart drill bits, even autonomous rigs that can drill oil wells on their own. VAN OORT: And if you see those in operation, that is definitely an oh-wow moment. BUCHELE: A lot of these advances took off after oil prices cratered a few years ago and companies tried to cut cost. It worked. These days, the U.S. is producing more oil than ever but at a cost. The Labor Department finds 50,000 fewer people working in oil and gas extraction than at the height of the last boom. Van Oort does see an upside. VAN OORT: The good side is that we are creating more sophisticated higher-end jobs in the process. BUCHELE: And, he says, it's making the traditionally dangerous oil field a lot safer. But it's not just roughnecks in the oil field who worry about their jobs. I met R.T. Hale at a diner back in Midland. R T HALE: I've got a machine shop down here, and I've been there 47 year. BUCHELE: He repairs old oilfield equipment. But he says it's getting harder. HALE: My machines were made in the United States. They've all went out of business. Things I used to repair, they just throw it away and stick a new one on it. BUCHELE: These days, he says, it feels like his old shop belongs in a museum. For NPR News, I'm Mose Buchele in Midland, Texas. Transcript provided by NPR, Copyright NPR.